Tait Communications welcomed some of New Zealand's top hi-tech performers to its global headquarters in Christchurch on Wednesday night, hosting the local entrants' event for the prestigious 2016 NZ Hi-Tech Awards. Entrants' events were held simultaneously across Auckland, Wellington and Christchurch to reveal the category finalists for the national Hi-Tech Awards. Seven Christchurch-based companies will contend for the top prize in categories ranging from best hi-tech start-up to hi-tech company of the year, demonstrating the breadth of talent in the region. The winner of the Tait Communications Flying Kiwi Award, recognising individuals who have made a sustained and outstanding contribution to New Zealand's hi-tech industries, will be announced at the national event. Winners of this prestigious prize are also inducted into the NZ Hi-Tech Hall of Fame. Trevor Laughton, General Manager Tait New Zealand, says "It's exciting to see the standard of innovation that's happening here in New Zealand. The more we can support this as an industry, the more our customers benefit and the more competitive New Zealand companies can be. 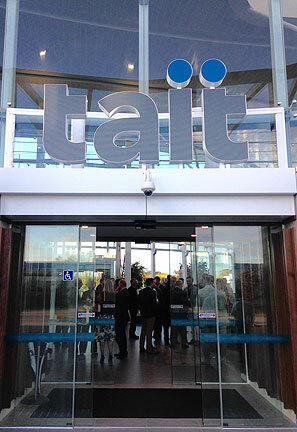 "Tait is committed to fostering local innovation through our ongoing sponsorship of the Hi-Tech Awards, our investment into our modern technology campus, our partnership with the University of Canterbury's Wireless Research Centre, scholarships in electrical and electronic engineering and paramedicine, and graduate internships. "We're very pleased to congratulate all of the 2016 finalists." Winners in each category will be announced at a black-tie gala dinner to be held in Auckland, in May.